Shimoga is situated in Karnataka state, south-west India, on the Tunga River. It was an important stronghold of the Keladi Nayakas in the sixteenth century, during which time the palace of Shivappa Nayaka was built. 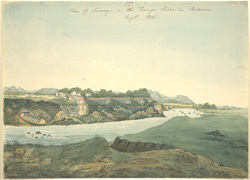 The town was plundered by the Marathas in 1798 and occupied by the British in the early nineteenth century after the Maratha wars. Shimoga is now an important industrial, commercial and educational centre.